Pacific Rim is doing very well in China, despite some tiny subtitle problems, proving again that the Chinese love giant robots. However, even with all the popularity, the Chinese military isn't very happy, claiming that the movie is nothing more than propaganda to spread "American values and ideas". Last Friday, an article appeared in the Chinese military's newspaper PLA Daily bashing Guillermo Del Toro's epic monster versus robot movie. In the article, which actually should be called an opinion or editorial, the writer makes claims that the movie is nothing more than a vehicle for America's propaganda machine. The PLA Daily itself is the official newspaper/media outlet of the People's Liberation Army, serving the same function as say the People's Daily, which is the mouthpiece of the Chinese government. The article, written by Zhang Xieli, was picked up and republished by pretty much every Chinese State media outlet including Xinhua, People's Daily, and the Global Times. In Zhang's article, Zhang claims that the movie and pretty much every movie out of Hollywood is a Western plot against China. However, reading Zhang's article, it almost feels like the PLA didn't even watch Pacific Rim, nor did they bother to look into the backstory. At one point Zhang tries to put the bulk of the movie's plot onto the US, effectively saying the Jaeger program, the Wall and the final assault were all orchestrated by the Americans to "save the world by playing the part of world police." Anyone who's watched the movie knows that this is not true. In his article, Zhang tries to tie everything to American imperialism as well as hint at the combined US-Japan effort to keep China in line, calling Mako's rescue by the American Jaeger a reference to "the real life US-Japan alliance." However, he overlooks the fact that China has taken a part in the movie—albeit a very small part. He also asserts that the Pan Pacific Defence Corps is run by the Americans — It isn't. In the related media of Pacific Rim, we learn the Marshal Pentecost is British — He is British. Also, the Pan Pacific Defence Corps is made up of people from all over the world, not just Americans. Zhang's take on the besmirching of Hong Kong and China through Chinese people eating and making things out of Kaiju—something he calls a "mockery of China's image and conduct"—is also, in this writer's opinion, ill-informed. In the opening voice-over there are various scenes of other countries also doing the same thing; it just happens that the bulk of the movie happens in Hong Kong. Most confusing of all of Zhang's commentary on Pacific Rim and Hollywood movies is his decision to include Ice Age as an example of movies which "disseminate the US' value system and global world strategy." It's unknown if he's talking about Ice Age the animated movie starring Ray Ramano as a wooly mammoth or some other movie called "Ice Age." What's most concerning about all of this is the fact that the movie has already done gang busters in China. This commentary on the movie comes rather late. On top of that, if the movie was really that subversive to China then why did they even let the movie play in the first place? Every non-China-made or non-state-sponsored movie needs Chinese government approval to screen in China. Well, whatever. 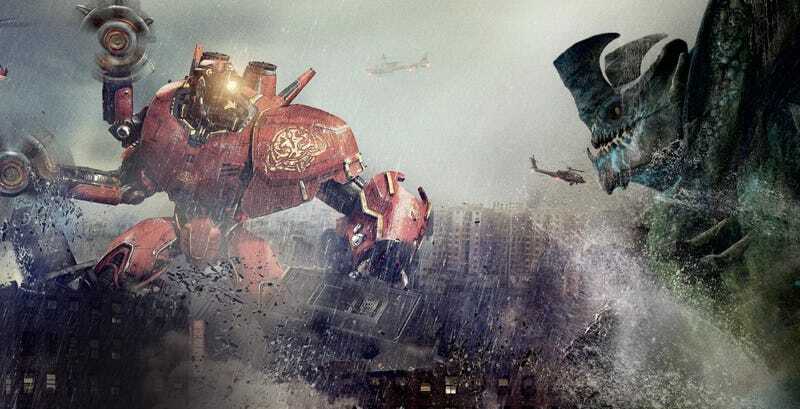 Pacific Rim's made over $100 million in China. Hopefully enough for a sequel.